Comprehensive review of Maybelline Solar Energy Long Lasting Self Tanner. See what real experts and actual users have to say about this self tanning product. I gave Maybelline Solar Energy Long Lasting Self Tanner 1 out of 5 stars, so I really didn’t like anything about it. First, the texture is so runny and makes it messy to apply. It also smells so bad. All I could smell is DHA, no fragrance or perfume. My tan was very light; I almost couldn’t see it. And the product is so shimmey; the shimmer got all over my clothes for the next 4 days. So overall, this product fell very short. This is a very thin, watery lotion that’s brown in color. The guide is pretty dark, but not the darkest I’ve seen. It also is very shimmery… wayyy too shimmery. I recommend using a tanning mitt while applying this one. The product is runny, so it will be very hard to apply without a mitt. The guide kind of disappears once you start rubbing the product into your skin. But you can definitely see the shimmer all over your body. Maybelline Solar Energy Long Lasting Self Tanner took around 20 minutes to dry. So the drying time was pretty average, nothing to complain about. But even after it dries the glitter gets on literally everything. It smells like DHA mixed with a bunch of chemicals. I could barely stomach the smell, and get past the fact that I was putting something that smelled so bad all over my body. The next morning, the awful smell was still there. It never got better and actually got worse. It smelled so strongly of DHA. I got a very light tan from this product. And my whole body was literally glittery for days. My tan was maybe 1 shade darker, I actually forgot I tanned the night before until I saw the glitter all over my body. For me the color was just not dark enough, it was pretty non-existent. I also didn’t like how shimmery my tan was. If I wanted to be shimmery, I’d buy a shimmer body oil or something. My tan only lasted 2 days. But the glitter stayed on my skin for around 4 days which was weird. No. I don’t think men will like it especially since it’s so glittery. 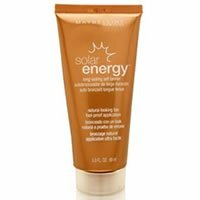 Maybelline Solar Energy Long Lasting Self Tanner is $6.65 per ounce which is way too much for this product. To buy Maybelline Solar Energy Long Lasting Self Tanner, Click Here. Look and Feel This is runny, brown liquid. Application Applying is messy because of the texture and guide. Drying Time It took 20 minutes to dry. Smell (After) The DHA smell lasted until I showered it off the next morning. Color Produced My tan was very light and super glittery. How Long It Lasts The tan lasted 2 days, glitter lasted 4 days. OK For Men? Nope, they won’t like it. Price It’s $6.65 per ounce.